Maine is one of the first states in the country to welcome the new year. In fact, you can celebrate two new year’s eves in Maine’s most eastern town! 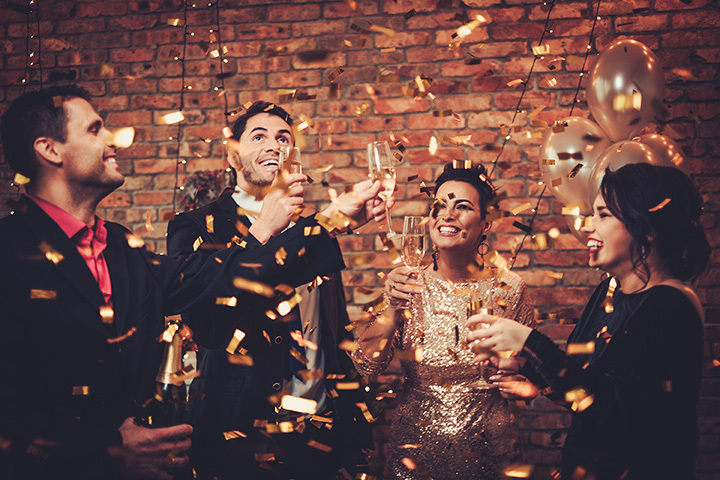 Whether you prefer to dance the night away, enjoy a delicious dinner and champagne toast, or end the night early with the kids, there are plenty of great events to welcome the fresh start. Spend a special New Year’s Eve at one of the Maine Huts in Maine’s backcountry. At the Poplar, Stratton Brook, and Flagstaff Huts, enjoy a unique once-in-a-lifetime experience welcoming in 2018. A four-course meal and champagne toast is served by a roaring fire. In the morning, you’ll enjoy a delicious home-cooked breakfast and packed lunch for your hike out of the backwoods. Have you been to a hut for lunch yet this summer? All four are open to the public Saturdays & Sundays 11:30-1:30. Ring in the New Year’s with the Bob Charest Band at the Sable Oaks Grand Ballroom in South Portland. Enjoy a cocktail hour with hors d’oeuvres and then dance the night away with your friends. Countdown to midnight with party favors and a midnight champagne toast. Every year, the town of Gorham puts on a huge family-friend New Year’s Eve party for all to enjoy. With ice skating, a spaghetti dinner, tons of games and crafts, face painting, and more, you can ring in the New Year with the kids long before the clock strikes 12. Enjoy lots of musical performers and fireworks at 9 p.m.
For the past 20 years, the city of Belfast has hosted an incredible New Year’s Eve celebration. Beginning at 2 p.m., this family-friendly, affordable celebration runs until 12:30 a.m. with over eight indoor venues within walking distance. Enjoy children’s songs and dance at the Belfast Free Library, jazz at the Boathouse, and the countdown by the bonfire at the Waterfront Pier at the Harbor Landing. From November through the end of the year, L.L. Bean hosts an epic holiday event called the Northern Lights at L.L. Bean. While the celebration focuses mainly on Christmas, on Dec. 31, L.L. Bean starts their New Year’s Eve Celebration at 11 a.m. There are tons of crafts, entertainment, concerts, and more for the whole family. Fireworks start at 6 p.m. Done with your Christmas tree? Bring it to the Last Blast celebration in downtown Old Orchard Beach. The bonfire starts at 4:30 p.m. and fireworks blasts off at 7 p.m. There is hot chocolate, s’mores, cotton candy, kettle corn, and more. DJ Joeyoke will keep the party hopping all night long. Gather in Bangor’s Westmarket Square and listen to live tunes and welcome in 2018 when the ball drops at midnight. Many of the local shops and eateries will be open late with music and comedy shows. Don’t forget to grab your crowns. Sunday River hosts a family-friendly New Year’s celebration for all ages. The PG-13 New Year’s Eve Party in the South Ridge Lodge has a photo booth, inflatable sumo wrestling, and lots of fun and games for young children. At 8 p.m. head to the slopes and watch fire dancers and the fireworks light the skies. For the 21 and over crowd, head to the Foggy Google for some adult fun. Every year, Maine’s local and favorite comedian comes home for the holidays to share all his favorite jokes to a sold-out crowd. Ring in the New Year while laughing with (or at) Bob Marley. You’ll hear some of his classic Maine jokes along with some new jokes and skits about the recent world events. After the show, head out to one of the local Portland bars for a midnight drink.